Rhododendron is an ericaceous shrub with large blooms flowering from early spring through summer. Rhododendrons thrive in well-drained soil with partial summer sun. They do not tolerate the winter sun well and can suffer damage if not planted in a proper location. Sun and cold can be their biggest threats. A browning of the leaves, or desiccation, occurs when the winter morning sun has drained the frozen plant of its water source. 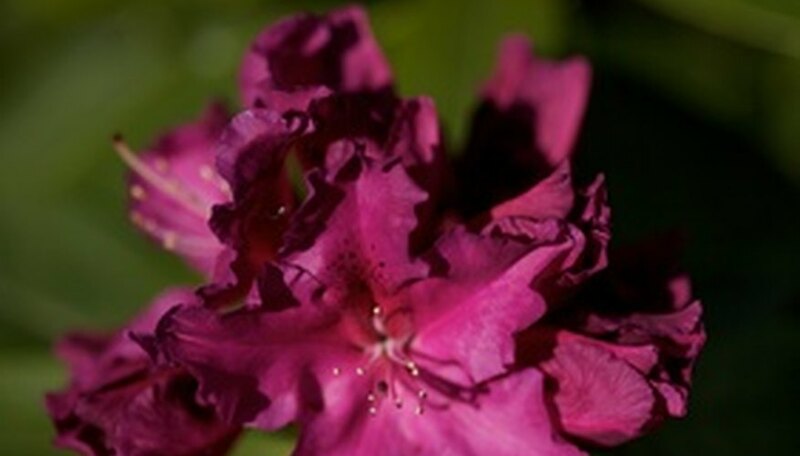 Since the rhododendron is a shallow-rooted plant, it must be given adequate water, especially in the summer months. Curled or twisting leaves signal distress for the plant. When these conditions are present, the rhododendron can be revived to health with a little extra care. Transplant the rhododendron to a location that is suited to its needs. Plant along a fence or building that will provide a windbreak for the shrub. Choose a location with partial summer sun, with very little winter morning sun. The north side of a building or fence fits this purpose well. Prepare the soil, adding compost as needed to promote a well-drained aerated soil with a pH of 4.5 to 5.5 acidity. Follow a strict watering pattern. Provide at least 1 inch of water per week to the rhododendron. Place a rain gauge near the shrub to determine the amount of precipitation it has received. This shallow-rooted shrub is susceptible to root rot if over-watered, but dries quickly in the summer heat. Water when the soil 1 inch below the surface is dry. Curled or twisting leaves are a sign of dehydration. Water when this condition is observed. Apply a layer of mulch around the rhododendron to retain moisture in the soil. Apply a fertilizer annually to the shrub in late fall after a hard freeze or in early spring. Choose a fertilizer for acid-loving shrubs that contains nitrogen in the ammonium form. Apply following the label directions. Remove weeds from the garden area. These take nutrients away from plants, causing health problems. Deadhead wilted flowers from the rhododendron by pruning at the base of the flower with shears.